Friendships were built young and have lasted for years for children who attended Linda’s Daycare of Winner. Linda Schroeder has been taking care of children for 37 years and recently retired. 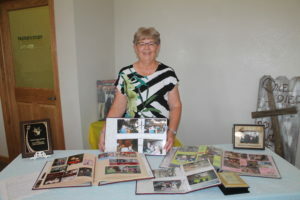 A retirement open house was held on June 23 at the Baptist Church of Winner. She started babysitting in the fall of 1981 on the farm 30 miles northwest of Winner. Her sister-in-law Alona Burtz was a teacher’s aide at one of the rural schools near the Burtz farm and needed someone to watch her children while she was at work. Linda said she would help out. Then, Laurie Bailey, who had 5 children, occasionally needed Linda’s help. In 1986, Neil and Linda Schroeder moved to Winner and moved into a home on Monroe Street. Neil had taken a job with the Department of Transportation in Winner. Two weeks after they moved to Winner, relatives seeking daycare sought out Linda. Over the years, Linda figures she has taken care of 126 children. She never advertised and noted it was just word of mouth as people referred their children to her. People knew Linda was very caring, loving and they trusted her to take care of their children. Dawn Covey says she was fortunate to have Linda be the daycare provider for all three of her children who are now ages 20, 25 and 28. Also, Linda took care of Dawn’s granddaughter, Kenna, daughter of Clint and Sarah Covey, for a period of time. “My kids loved Linda’s house,” said Dawn. A typical day at the daycare would start around 7:30 a.m. and would last till around 5:30 p.m.
Linda notes she never had a lunch hour as she was always busy with kids. Linda said she never had a set schedule. “I felt kids need to be kids and life is too busy,” she said. Linda read a lot of books to the children. Dawn Covey credits her kids being good readers to Linda. “She spent countless hours surrounded by ‘her kids’ reading numerous books to them,” said Dawn. Linda said the children loved to paint and they would do water color painting. “I tried to do learning activities without it seeming like it was preschool,” she explained. Linda likes to do crafts so the children would do crafts with her. They would make valentines, gifts for mothers on Mothers Day and much more. Linda loves flowers and she would let the children pick flowers to take home a bouquet to their parents. Linda added the children loved to blow bubbles outside. Over the years, Linda baked a lot of cookies and if fact, this week she was baking chocolate chip cookies for her open house. There was always a good lunch and snacks at the daycare. Around 10 a.m. Linda would serve a morning snack of crackers and cheese, peanut butter toast, fruit or cookies. Over the years, Linda made a lot of homemade bread. At lunch everyone sat around the table be eat. She said some of the lunch favorites were homemade pizza, goulash, mac and cheese and lasagna. “I have kids today who will stop me and tell me that no one makes goulash as good as I do,” she said. To allow her time to prepare lunch Linda tries to find a good PBS show or a good movie to keep the kids entertained. Linda used to take the children to the library for story hour and also if there was a smaller group they would go to the library to pick out a book. When the weather was nice Linda and the kids would walk to the park to play. The Schroeders have a lot of playground equipment in a fenced in backyard which gave the kids plenty of room to play. The kids she took care of ranged in age from infants to youths getting ready for school. As the children in her care got older and getting ready for school she could feel they we outgrowing the daycare. “The older ones were so smart and would come up with some amazing and funny things,” she said. Linda explained she had the most wonderful families and they were so good to her. “I still get Christmas cards from so many of the families,” she said. Linda has an album filled with pictures of the children over the years. Linda loves going to football games and boys and girls basketball games and seeing how the young people she once cared for have matured. “You know those are ‘my kids’ out there,” she said. Linda was so honored when one year she was chosen as the Winner High School homecoming parade marshal. That year some of the students on the WHS student council were former youths at her day care. But it is not only sporting events, she goes to graduations, weddings and other special events and is so proud of each person. Haley DeMers and Ashleigh Tuttle were also at Linda’s daycare and were roommates at the University of Sioux Falls. A new weeks ago Linda attended Tuttle’s wedding with DeMers in the wedding party. “Friendships were built young and have lasted,” said Linda. When Linda’s kids were getting active in school events, she took off Fridays so she could attend the games. About three years ago, she decided to take off all summer and then start again when school began. Her last day at the day care was a couple of days after Memorial Day. Linda went to college and majored in child development. She went to South Dakota State University for a year and a half and Northern State University for a year. Over the years Linda said there were very few discipline issues. The kids were good. “I was a part of their family and that is what I wanted to be because I treated them as family,” she noted. Dawn added that Linda was good about capturing those moments in photos and then sharing them with the parents. Dawn’s son, Carson, was one of those children who had the benefit of being in Linda’s daycare. Carson just finished his master’s degree at North Dakota State University in Fargo. He has accepted a 6-12 grade vocal music position in Mountain Lake, Minn.
Carson said there are other things that stand out about Linda. “After I reached an age when I no longer needed daycare Linda still cared about what I was doing. This lasted from the time I was a kid until even now as she was/is frequently at many high school events where many of her previous “kids” are participating. She attends many of her past “kids” graduations and was even in attendance at my wedding. “This is just one example of how she has compassion and cares about every child she has taken care of. Another thing about her daycare that stood out to me is the lasting friendships that I created there. Many of the kids I attended daycare with are still some of my good friends and I believe that is because of the positive environment that Linda created when running her daycare. I consider myself lucky to have had a babysitter like Linda and I know there are many of her “kids” that feel the same way. I wish Linda a happy and enjoyable retirement,” said Carson. Linda and Neil have four grown children and 12 grandchildren. The four children include: Brad of Canistota who works for Eros Data Center and has five children. He has a farm and raises lots of sheep; Kim DeMers of Winner has three children and she is employed by the Winner School District; Jeremy lives on the farm and has two boys and Bruce lives in Aberdeen and works for the Department of Transportation. He has two children. With 12 grandchildren, Linda is looking forward to being able to go to some of their events. She will also be able to spend more time with her mother, Marian Burtz who just turned 90. 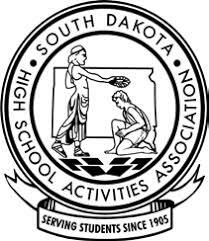 The 2017-2018 school year marked the 22nd year of recognition by the South Dakota High School Activities Association of athletic and fine arts groups for academic excellence. Winner High School groups honored are: girls track and field, student council, large group band, large group chorus, boys track and field, yearbook and girls golf team. Colome group honored was girls track and field team. Any varsity athletic team or fine arts group achieving a combined grade point average of 3.0 or higher is eligible to receive the SDHSAA academic achievement team award. Numerous independent studies conducted by the U.S. Department of Education and major universities continue to demonstrate that students who are involved in interscholastic fine arts and athletic activities tend to have higher grades in school, have better school attendance, and have fewer disciplinary problems than non-participating students. These studies clearly show that high school students learn valuable lessons and lifetime skills, not only inside the classroom, but also through their participation in fine arts programs and school athletics. Mosquitos are nasty this year. The city of Winner has been out as much as possible. Unfortunately, the city is unable to spray while raining as it does no good. For the fogger system, the best time to use it is early in the morning and later in the evenings. This means city crews are out late at night or very early in the morning when most people are sleeping. 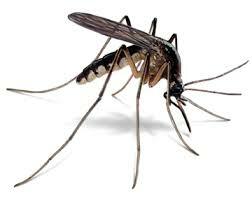 This is the most effective way to kill mosquitoes. The city says mother nature has not worked well this year in allowing the spraying to be done. The spray that is used is not harmful if a person comes in contact with it. South Dakota Highway Patrol troopers responded to a crash about five miles east of Winner on June 20. The driver of a Chrysler PT Cruiser lost control of their vehicle after they fell asleep. 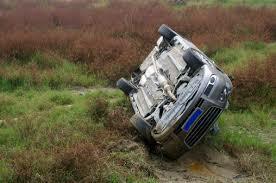 The vehicle entered the ditch and rolled. The driver, who was wearing a seat belt, received minor injuries. The Tripp County ambulance assisted. 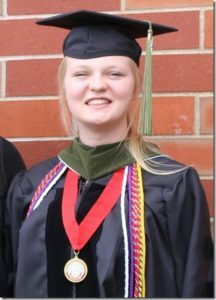 Sarah Calhoon was hooded and received her doctorate in pharmacy on May 5 from South Dakota State University. Dr. Calhoon has accepted a position as a staff pharmacist for Dave’s Pharmacy in Hemmingford, Neb. Calhoon is a 2012 graduate of Winner High School and the daughter of Mike and Susan Calhoon of Ideal. The Corn Palace Area Club volleyball teams competed at the junior volleyball association Midwest festival June 9-11 in Wisconsin Dells, Wis. The CPAC 17 Black won the 16-17-year-old division. 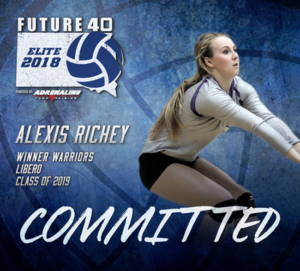 Alexis Richey of Winner was a member of the Black team. The CPAC Black team went 8-0. The team defeated squads from Illinois, Iowa, Wisconsin, Minnesota and Indiana. Winner/Colome amateur baseball team defeated Mt. Vernon 9-5 on Thursday at Leahy Bowl. 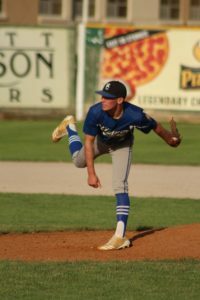 Derek Graesser took down 15 batters in the Sunshine League victory. Graesser gave up five hits and five runs. Drew Weber had three of the team’s 11 hits. Reed Harter had a single, a double and drove in a three runs. Austin Calhoon and Austin Richey each had two hits. Geno Katz added a double. Zach Harter hit a single and Kelly O’Bryan drove in two runs. Winner/Colome is 12-1 overall and 8-1 in the Sunshine League. They are tied with Alexandria Angels for No. 1 in Class B.
Dimock/Emery nipped Winner/Colome amateur baseball team 3-2 Sunday in Emery. Conner Hopkins took the loss for the Pheasants over nine innings. Austin Richey had a hit and RBI while Kelly O’Bryan led the team with two hits. Winner/Colome will travel to Platte on Thursday and will play in a benefit tournament in Mitchell on Saturday. The Pheasants will play the final game against Sioux Falls Brewers. 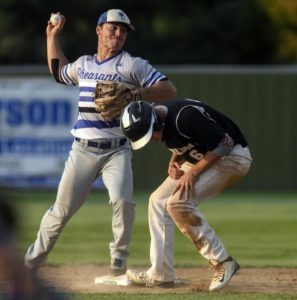 Winner/Colome will be at home on Sunday when they host Parkston at 5 p.m.
Winner/Colome Legion baseball team was shutout by Platte-Geddes 6-0 on June 19 in Winner. In hitting, Jackson Kinzer and Chase Dufek each had a single. In pitching, Levi McClanahan pitched four innings, giving up 5 runs on 5 hits with 2 walks. Chase Dufek pitched 3 innings with 1 run, 1 hit, 2 walks and 2 strikeouts. “We just are not playing very good baseball right now,” said coach Drew Weber. “We can put things together in bits and pieces but we just haven’t really put a full game together. This was our first game in which we had our full team there, which helps, but we need our pitchers to throw more strikes and our defense to be able to limit errors better. We have plenty of time to put things together,” said Weber. 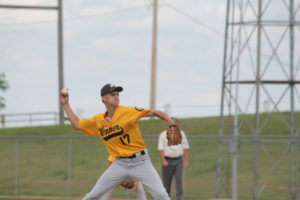 On Thursday the Winner Junior Legion team traveled to Onida for a double-header against Sully Buttes. In game 1, Winner won 7-3. Jacob Beckers started on the mound and threw 3 innings, allowing 1 run. Fred Whiting and Phil Jorgensen pitched in relief. Offensively, Jesse Colsen had 2 hits and scored 2 runs. Beckers had a hit and a walk to go along with 2 runs scored. Tyler Olson, Bosten Morehart, Adam Cole all contributed hits as well. In game two, Winner won 9-7. Joren Bruun started on the hill and pitched 2 innings. Kameron Meiners, Evan Farner, and Phil Jorgensen all pitched in relief, as Winner worked with a strict pitch count in preparation for Sunday’s round-robin. At the plate Colby Kaiser had a big night, going 3 for 5 with two home runs and 3 RBI’s said coach Kory Foss. Fred Whiting was 3 for 4 with a home run and 3 RBI’s as well. Oscar Pravecek, Farner, Jorgensen, and Meiners added hits as well. Sunday Winner defeated Wagner 6-3 at home. Joren Bruun threw 6 2/3 innings on the mound. Kameron Meiners finished the game. On offense Meiners had 2 hits and 2 RBI’s. Oscar Pravecek had 2 hit’s and an RBI. Fred Whiting also added a hit and RBI. “Joren threw just a phenomenal game. Probably the best start we’ve had so far this year. He located his fastball well, and his curve had nice bite to it. He met his pitch limit with 2 outs in the 7th so Kameron came in to finish the game. With the win Winner moved to 10-2 on the year. The Junior Legion was supposed to play Stanley County later on Sunday night but it was cancelled due to the weather. The next game is Wednesday (June 27) at Bennett County at 6 p.m. central. 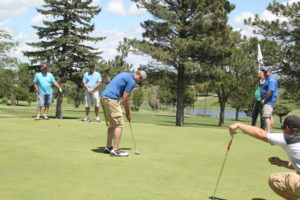 John Halverson and Anthony Husher were the champions of the Frontier Motors Open at the Winner Country Club on Saturday. Second place in the championship flight went to Fisher and Larson with Godel and Godel taking third. Winners of the first flight were Benedict and Goodell with Aaker and Gardner taking second and Calhoon and Neugebauer taking third. Winners of the second flight were Beehler and Kaiser. Second place went to Miller and Schmidt with Cahoy and Mathis taking third. The champions of the third flight were Haley and Haley. Second place went to Cahoy and Witt with Berg and Schlomer taking third.